This time last year we were finishing up our time in Saigon and heading south to see where Anh was born near Can Tho. Little did we know, I was also pregnant with our little lady. Such a special time then, and even more so looking back. I love thinking that her first days were spent where her father was born, eating the foods he ate and we still love, and seeing all of the sights from his homeland. But anyways, let me (finally) get on with photos and happenings from our amazing travels. A long, but pleasant flight on All Nippon Airways from DC to Saigon via Tokyo Narita touched down late on a Sunday evening and upon arrival we were blasted with the heavy humid air of the city. It felt so so good. A quick note about flights – if you aren’t splurging for business or first class, look at the equipment for your flight and consider opting for economy plus. We paid an extra $500USD each but were the only two seats by the window and enjoyed the extra legroom, food options and no having to get up for or move away from annoying seat-mates. Our hotel was near Ben Thanh Market in the heart of District 1, a convenient jumping off spot for our two days of touring. As we would discover over our two weeks in Vietnam, the hotels are certainly dated in relation to our American expectations, but amenities were great. You can get a great hotel for less than $100USD/night, just know that you won’t have a Westin Heavenly mattress. After only a few hours of sleep, we were roused around 4:30am by a loudspeaker proclaiming “Bánh mì ở đây! Bánh mì ở đây!” Fresh bánh mi (baguettes) being delivered and for sale by bike. I assume this happens across the city, we weren’t on a block with particularly high traffic or concentration of food stalls any more than other districts. Every morning in every city we heard a variation of this – who needs an alarm clock? Our first food (beside the dragon fruit, baby bananas and lychees from the room) was from the hotel’s breakfast buffet. They had European continental items – powdered eggs (probably), sausages, ham and cheese – as well as Vietnamese options. From this first morning I fell in love with bún (noodles) for breakfast. I still miss it. Chả lụa (Vietnamese ham) noodle soup and fresh fresh fresh tropical fruits. Can you tell Anh was happy? Everyone will tell you don’t drink the water unless bottled. But it is so blessed hot, they serve everything with huge chunks of ice, and it is usually filtered (but you can’t be sure). Just drink the iced drink. Don’t drink or brush your teeth in the sink. You’ll be fine. Low chairs and an old school hi-fi in the back playing Vietnamese ballads. What could be better? You see the purse slung over my shoulder. Pickpockets are a legit concern. It’s best to leave your valuables in the hotel safe and only carry the cash you need. If you do carry a bag – which I did for my phone/camera and money – always keep it to your front and keep it zipped. Fellas, put your cash in the front pocket. Better safe than sorry. We met our local guide from Ann Tours and began our day with a few tourist stops. I suppose the Notre Dame Cathedral and Post Office are “must sees”, but honestly I’m more interested in local fare and experiences rather than French-built buildings (reminiscent of DC). They’re worth a quick drive by or stop in, provided you have the time. 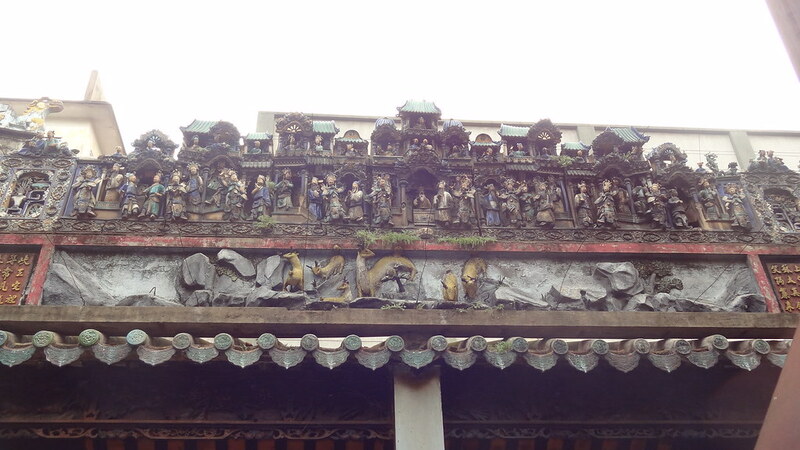 The Jade Emperor Pagoda was breathtaking, if claustrophobic. Built in 1909 it is a remarkable Pagoda where the neighborhood still prays and makes offerings. You can purchase birds and turtles right outside the walls, although they are rounded up and tossed in the river, from what our guide told us. The sights, sounds and smells are hypnotizing. I was awestruck by the scooters and motorcycles carrying dizzying loads of goods and wares or passengers all across the city. 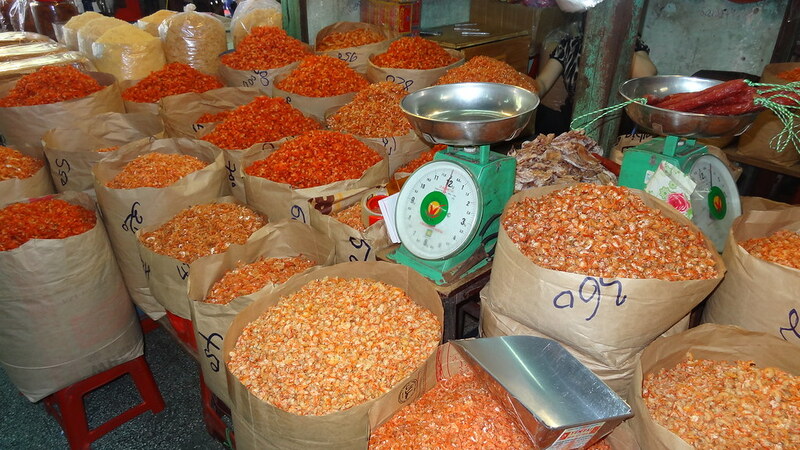 Our first market – Cholon (Chinatown) – was absolutely amazing. We stopped to watch a guy strap dozens of bottles of nuoc mam to his bike, and that was an easy load! Interesting fact, Cholon is called such because to call the market Chinatown or Chinatown Market would assume ownership of the area by the Chinese. We learned a lot about the tense and tricky relationship with Vietnam’s neighbor to the north. Anyhow, I loved every market we visited over our two week journey. The variety and scale of everything for sale was awe-inspiring. You could purchase spices, fresh seafood, clothing, cooking equipment and toys all within a space of 100 feet, although the aisles of goods stretched on for what seemed like miles. Where shop owners and women used to frequent markets early in the morning, now you can call your favorite vendor and place an order to be delivered by motorbike. After roaming through Cholon, we walked to the nearby Pagoda of the Lady of the Sea. Stunning carvings and idols set throughout the temple and altars. This temple was so serene, I could have spent hours just taking it all in. 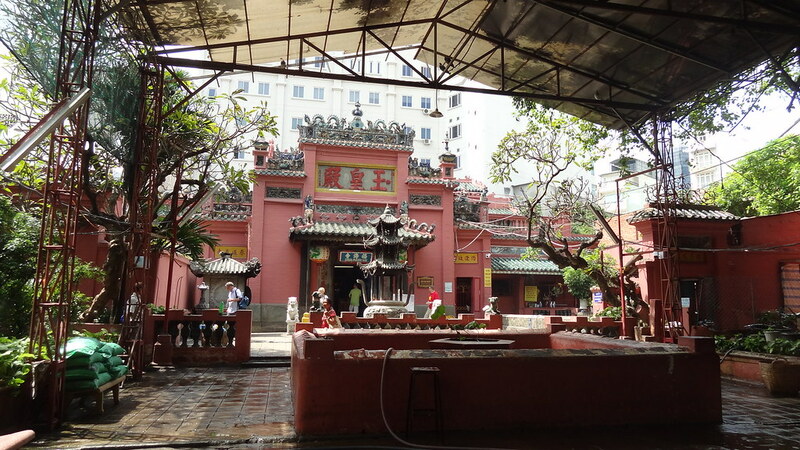 This compared to the stunning, but claustrophobic Jade Emperor temple from earlier in the day. Photos don’t do the carvings justice. Simply gorgeous. As you can see the weather started to turn, so we abandoned touring and went to find lunch. Our first, and really only, authentic Vietnamese meal in the city was Bún Riêu Cua – crab and tomato soup. This was our first lesson in finding great places to eat. Restaurants aren’t really that. They are shops, stalls or street side stands with low stools that specialize in one thing, and you go there for that alone. My bowl of Bun Rieu Cua Oc (crab and snail and fish balls) with pennywort drink. 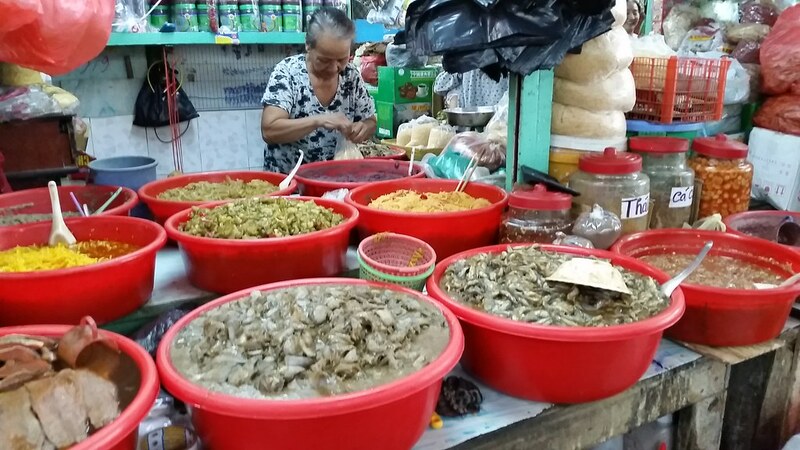 They make one gigantic cauldron (I mean, that is what it is) of the soup and have the different seafood toppings in different quadrants – crab, snails and….something else I can’t remember. You could also get pig knuckles and other pork on display in the stand behind the pot. Our dinner recommendation was pretty disappointing, as I don’t think our guide really appreciated our desire for true Vietnamese food. Instead he suggested Wrap and Roll…which sounds great in theory. I like rolls. I like variety. These are all great things. But in execution, it was like an Epcot version of Vietnamese cuisine. That coupled with the fact we walked in the pouring rain back and forth along the same block trying to find the damn place, led to our disappointment. The next day we woke up and met my in laws who arrived the night before. We had only a few hours in Saigon that morning before we met up with our family friend driver to take us further south. We walked down the street to Highlands Coffee (the equivalent of a Starbucks) and had our first pho and more iced coffee. Sad to say the pho was better than many restaurants here in the US! After breakfast we crossed an *insane* traffic circle to get to Ben Thanh market. The traffic never really stops, so you just have to keep moving and not stop to wait for vehicles. They will work their way out of yours. Just go with it (and say a little prayer). Propaganda poster on the other side of the traffic circle. 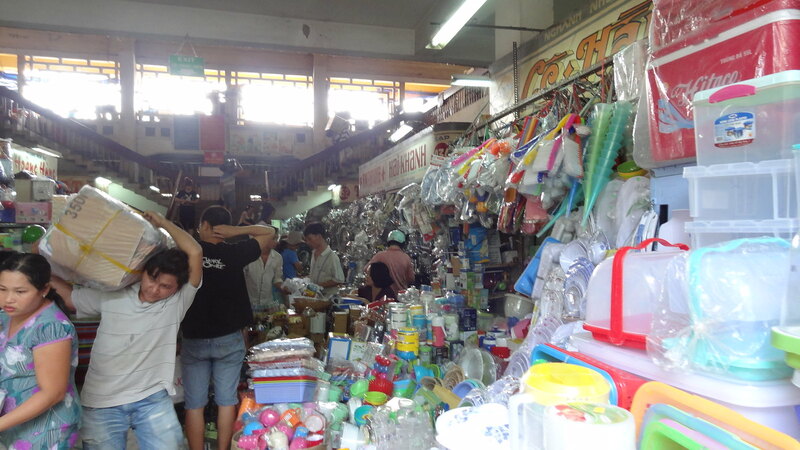 Ben Thanh market is pretty tame, but still nice to walk through. We saw some gorgeous seafood, produce and fresh flowers, and picked up some dried fruit snacks for our journey south. From there we met up with my in laws and met an aunt and uncle living in Saigon. It was great to meet family for the first time and see the joy of reconnecting after many years apart. After a short visit, we met with family who drove up from Can Tho with a van to begin the next leg of our trip. But not without loading extra luggage filled with US wares for family and friends. Chao, Saigon! Next up, Can Tho!